Whatever Fione Tan touches, it turns to Internet gold. So, it is no surprise when the founder and CEO of eOneNet.com launched 28Mall.com in 2016, it has gone on to become one of the most successful online shopping sites. Fione Tan has been dubbed Malaysia’s Superwoman and The Internet Magician by her fans and admirers, and with good reason. This Malaysian entrepreneur is a visionary. She is able to zero in on what would be the next big thing even before the rest of the country and Asia are able to figure out. How else can one explain her faith in the Internet as a game changer in the business world during its infancy in Malaysia? She started a website called eOneNet which has been ranked the number one Internet Marketing Asian company by Google since 2000. This website helps companies “sell and increase sales online globally using various platforms and online marketing tools with offices in Kuala Lumpur, Singapore, Hong Kong and China”. It has even been noticed by the world famous e-commerce company, Alibaba, which has chosen it as its official strategic and training partner. eOneNet has gone on to win various awards, including the prestigious Hong Kong Distinguished Brands 2009. Fione has been acknowledged as the world’s top Internet marketing coach; a fantastic achievement by a Malaysian. Realising the rising popularity of e-commerce in Asia, she launched 28Mall.com in Hong Kong and Malaysia in 2016. 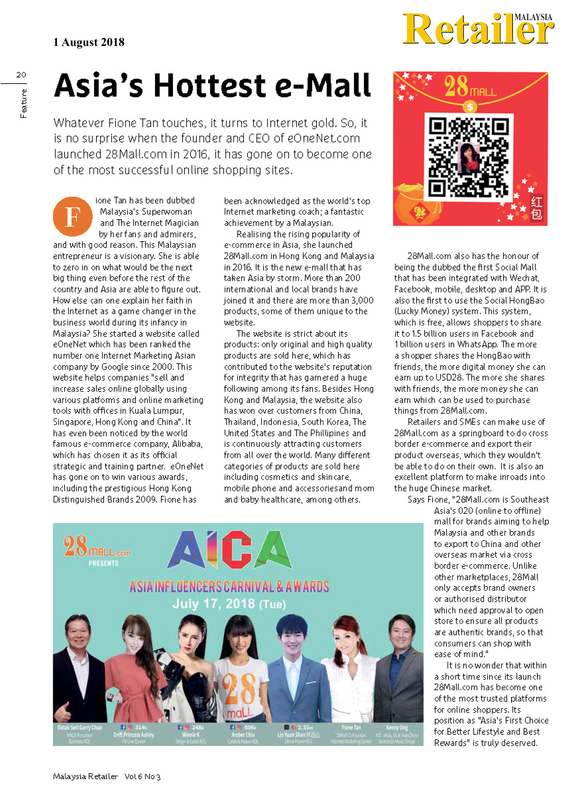 It is the new e-mall that has taken Asia by storm. More than 200 international and local brands have joined it and there are more than 3,000 products, some of them unique to the website. The website is strict about its products: only original and high quality products are sold here, which has contributed to the website’s reputation for integrity that has garnered a huge following among its fans. Besides Hong Kong and Malaysia, the website also has won over customers from China, Thailand, Indonesia, South Korea, The United States and The Phillipines and is continuously attracting customers from all over the world. Many different categories of products are sold here including cosmetics and skincare, mobile phone and accessoriesand mom and baby healthcare, among others. 28Mall.com also has the honour of being the dubbed the first Social Mall that has been integrated with Wechat, Facebook, mobile, desktop and APP. It is also the first to use the Social HongBao (Lucky Money) system. This system, which is free, allows shoppers to share it to 1.5 billion users in Facebook and 1 billion users in WhatsApp. The more a shopper shares the HongBao with friends, the more digital money she can earn up to USD28. The more she shares with friends, the more money she can earn which can be used to purchase things from 28Mall.com. Retailers and SMEs can make use of 28Mall.com as a springboard to do cross border e-commerce and export their product overseas, which they wouldn’t be able to do on their own. It is also an excellent platform to make inroads into the huge Chinese market. It is no wonder that within a short time since its launch 28Mall.com has become one of the most trusted platforms for online shoppers. Its position as “Asia’s First Choice for Better Lifestyle and Best Rewards” is truly deserved.